Paella is probably the most well-known and often eaten dish in Spain. Spanish recipes for this rice casserole with meat, herbs, and vegetables are passed down for generations. One of the best ways to ensure a delicious outcome for your own paella is to cook it using a special paella pan. These paella pans have looped handles, sloped sides, and are shallow in depth and make it easy to successfully prepare this popular dish. There are many sizes of paella pans available. All of them have the same basic design but materials may vary. We have highlighted the top six paella pans that are very popular with cooks. These pans are created by reputable manufacturers and have been constructed carefully from quality materials that stand the test of time. Choosing the right paella pan is possible if you take the time to learn about what makes one pan better than another. If you are looking for the perfect paella pan to add to your, one of these quality paella pans will be the perfect choice. This paella pan from The Garcima is just what you need to cook delicious paella. The pan comes from Spain and requires no lid. It is the perfect size for the home kitchen and provides enough for six to eight servings. Constructed from carbon steel, this paella pan is long lasting and durable and can be used in the oven, on the stovetop, or even on a charcoal or gas grill. This is the perfect pan to take on picnics of camping trips. Carbon steel changes color after they have been used for a time so you will need to do some light maintenance on your Garcima paella pan to keep it working and looking great. The maintenance is easy; just wash in hot soapy water right away after cooking with it, dry by hand and then coat the pan with oil. If any rust shows up it can be removed easily using a steel wool pad. The Garcima offers customers a 100% satisfaction guarantee, that if you are not happy with your paella pan for any reason they will give you your money back, no questions asked. This authentic Paella pan from Garcima provides 26” diameter of space to cook delicious paella for your family and friends. The carbon steel construction conducts heat perfectly for even cooking throughout and gives the pan a high level of durability. 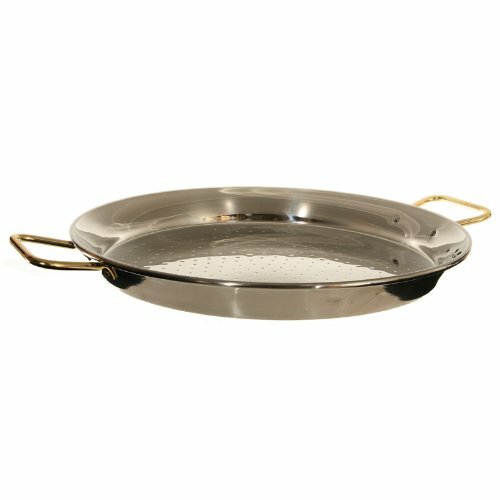 Cooks can use the Garcima Paella pan on the stovetop, on the grill, or in the oven. The thin design of the pan is perfect for the best results and is very rigid with a hammered bottom. The steel handles are bright red and go well with your other kitchen tools and appliances. This 26” diameter pan serves 12 to 20 people and is easy to take care of; just hand wash after use, dry it right away and rub a small amount of vegetable oil on the inside to prevent rust. Garcima does it again with this durable Paella pan that measures 16” in diameter and is the perfect size for cooking smaller amounts of Paella. This attractive pan is made from stainless steel with gold-colored handles. This pan can be used on the grill, in the oven, or on top of the stove. It is the perfect size to fit on a medium-sized burner on top of the store. The mirror finish of the pan looks great in your kitchen and goes with any kind of décor. The thin, single-ply metal is perfect for cooking all kinds of rice dishes and is not meant for high-heat cooking. One of the best things about this paella pan is that it requires no special care and is virtually maintenance free. It also looks fantastic hanging up on display on a pot rack in your kitchen. Nordic Ware is known for quality kitchen cookware as this attractive Paella pan demonstrates. It is constructed from heavy aluminized steel that distributes heat from edge to edge evenly. This makes for even cooking without hot or raw spots. The handles of this pan are made in Taiwan and the rest of it is made in the USA ensuring quality and longevity. It is the perfect pan to make tons of delicious Paella and can also be used for making crepes and other types of dishes as well. All of the top-rated Paella pans we have reviewed and listed above are high quality and are perfect for cooking this delicious, popular, Spanish dish. Any one of them will provide what you need to cook your paella in and can even be used for other rice dishes and foods. Remember that most paella pans do not do well under high heat; the pan can become damaged. There are many different pans designed especially for cooking paella available on the market. For this reason, it’s important to have the knowledge you need to compare the different pans available and see which one or ones fit your specific paella-cooking needs. The buyer’s guide below serves to provide the knowledge you need so you are ready to find exactly what you are looking for in a paella pan. We’re going to talk about the features to look for and which materials are better than others. Once you have the information you need you can rest assured that you will purchase the perfect pan for your needs and save yourself the headache of choosing the wrong one and having to return it to the company. The origin of the paella pan was in Valencia, Spain. A paella pan is a specially designed pan that was created for cooking paella, a traditional and popular Spanish dish of rice with meat, vegetables, and herbs. The paella pan is typically a thin, sturdy pan with looped handles and sloped sides that make cooking this popular Spanish dish fun and easy. These specially designed pans can be used for other dishes, but their primary purpose is to cook paella. Making sure that the paella pan you purchase has all the features you are looking for is very important if you want to be happy with that purchase. A good paella pan has several particular traits that we are going to cover below so you understand what to look for when you’re researching. Pan Size – One of the most important considerations you will make when looking at different paella pans is the size. There are many different sized paella pans available, the most commonly used being between 9” and 12”. If you don’t have a large number of people to cook for the smaller sizes will work just fine. Make sure that the pan you choose can handle the method of cooking you like for your paella such as being small enough to fit in the oven or on the stove. Pay attention to the size of your paella pan’s handle as well and make sure that the handle is dishwasher and oven safe before you put it in the oven or dishwashing machine. Below we have provided a chart of the common paella pan sizes and the typical number of people that each size serves. Pan Materials – Paella pans are made from a variety of materials. The material used in the construction of your pan will determine how well it works to cook paella. The most popular material is carbon steel or stainless steel. Carbon steel does require some maintenance after using it, but the maintenance is not difficult. Carbon Steel is a reactive material that conducts heat quickly and adds a desirable flavor to the food. The thing people don’t like about carbon steel is that carbon steel can rust if it is not taken care of properly. The maintenance requires hand washing, drying, and then the addition of vegetable oil that is rubbed into the inside of the pan after each use after its cleaned. Other materials include stainless steel which is beautiful in appearance and easy to maintain. They are more costly than other materials but last years. Iron is the least desirable material used for paella pans because they retain too much heat. Pan Design – Most original paella pans have the same basic design. The metal used, whether it is carbon steel, stainless steel, or iron, is thinner than the typical pan but very rigid. The thinness of the material allows the pan to cool off quickly once it is removed from the heat. These pans are wide with sloping sides and are shallow as well. The handles of the paella pan are looped and located on either side of the pan. Cast iron pans look good, but it isn’t recommended to purchase cast iron pans for paella due to the fact that it holds heat for long. Pan Handles – The handles of the paella pan are important because that is how you will move the pan from place to place. On a paella pan, the handles are looped and there are two, one on either side of the pan. Pan handles may not be made from the same materials as the pan itself so make sure that your pan handles are dishwasher and oven safe before putting the pan in either one of these appliances. Handles may be a contrasting color such as the red handles on a couple of our top rated paella pans, or they can be a little more flashy such as the paella pan we reviewed with gold colored handles. If paella is a dish that you like to cook often, you will be doing yourself a huge favor by getting a specific paella pan for this task. Most people who cook paella know that the dish comes out better and more authentic when they use the pan that was created for this particular dish. Paella dishes range in price from inexpensive and affordable to higher quality, high dollar models that can cost close to $100 or more. Most of the authentic paella pans on the market are made in Spain, providing a true authenticity that enhances the experience even more. You can cook paella in a regular pan, but it is much easier and doesn’t have the potential problems that regular pans can have such as doming and damage that can occur from heating certain types of pans, such as aluminum, over high heat. The reviews and top rated paella pans we have featured in this article are all high quality pans that will help you cook the most delicious, authentic paella dishes you can. Any one of them will be a great addition to the kitchen. In this buyer’s guide you have learned what features make a great paella pan, what to look for when shopping, and what materials are the best suited for this type of pan and much more. 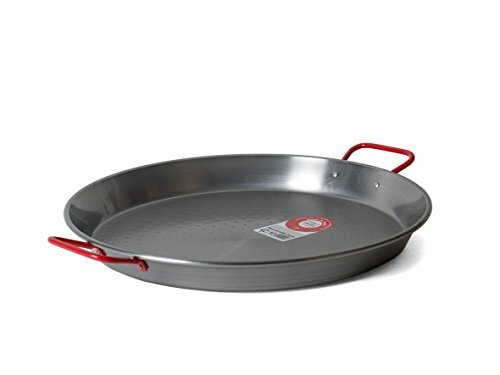 Choosing the right pan will not only be fun to use since it will be an authentic pan made with traditional handles, carbon steel materials, and dimples in the bottom, but it will be easy to use and will produce the kind of delicious Spanish dish that your friends and family will love. This knowledge will make it very easy to sort through all the pans out there that are authentic paella pans and ones that can be used for cooking this popular dish. 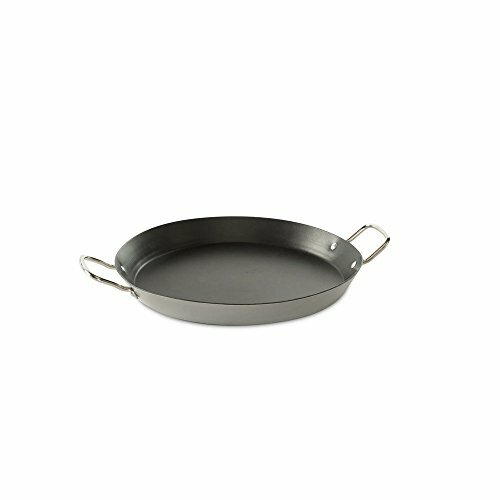 Paella pans can be used to cook other things as well such as omelets, grilled cheese and other dishes that do well in shallow pans. Having the right information will enable you to make a confident choice that will be the best for your money.